Tariffs, Big Red Car? Really? Big Red Car here thinking about tariffs. I am sure you are interested in tariffs. They are an effective tool to control access to the world’s best and biggest market – the United States of America. That is the big win for the rest of the world – access to our market. Until 1913, tariffs also funded our government, before the advent of the income tax. They are an important element in the history of the US. As you can see, the US had high tariff rates until the time of the World War II Era Bretton Woods Agreement. 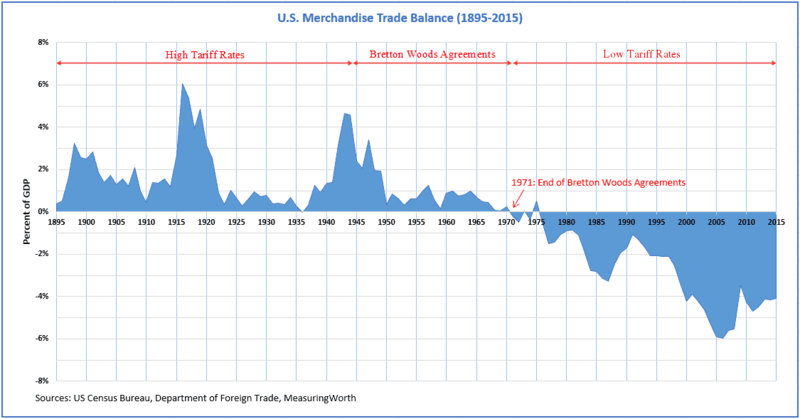 Starting in 1970, the US lowered its tariffs dramatically in support of notions of free trade. Free trade should, also, be fair trade. As you can see, during times of higher tariffs, the US trade balance was positive. Since the advent of lowered tariffs, the US trade balance has gone and stayed negative. I support the Trump admin’s efforts to drive equilibrium back into the trade balance with the strategic use of tariffs. But, hey, what the Hell do I really know anyway? I’m just an American made Big Red Car. Be good to yourself and think about tariffs, free trade, and fair trade. This entry was posted in Economy and tagged tariffs. Bookmark the permalink.